Summer means more sandals and more thongs – and for me dry heels that make a frilled-neck lizard look smooth. One product I’ve been raving about for over 18 months is Milky Foot, the only product I have ever tried that truly works for dry, hard heels. Milky Foot is super easy to use, just place your feet in the booties letting your tootsies soak up all the liquid and after 60 minutes showering and drying off. After your feet are dry you’ll be concerned wondering why your heels still look the same and think you’ve not followed the instructions correctly (this still happens to me). The process of de-shedding can take up to 5 days to start but once it begins you will peel up a storm (my fave part). When the peeling ceases you will be left with gorgeous and soft Milky Feet. The best part about this product is that the results really do last, unlike a pedi where you’re back to square one a week later. I usually do one of these treatments approximately 4 times a year to keep my tootsies in tip-top shape. Milky Foot has also released a new product called Foot Care Essence that is a great aftercare product and will keep your feet in fabulous shape. It’s great for people who are on their feet all day or for people like me who trot around in heels constantly. These are two superb products and are big summer must-haves to keep you looking more lush than lizard. Standing all day, restrictive shoes, nylon stockings and exercising in sport shoes can contribute to funky feet issues like hardened, rough skin and bad foot odour. 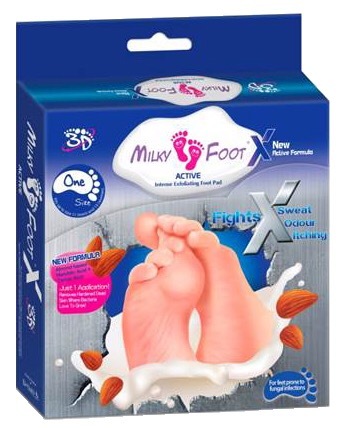 In just one simple application, MILKY FOOT ACTIVE not only removes hardened dead skin but fights foot odour to reveal softer and fresher feet. Available from pharmacies nationally including Chemist Warehouse. OMG!! When I read this I thought I had died & gone to heaven!! Regardless if I win this or not I NEED this product in my life!! Thank Mrs Tink for the intro!! I stupidly went to one of those little Asian Nail places about 3 years ago & had a pedicure.. The place obviously didn’t meet hygiene standards as 3 months later I started to first notice the onset of a Fungal nail infection, that meant I lost three nails on one foot including the big one & I got Staph to which I still have to this day..
Well mine don’t. But Ma lives a hood old garden, and clean and wash and all the housework with heels that slap her heels and dry and crack them. She deserves some heel love for those dried and sore little footsies. I went to Tasmania and wore sandals the whole time even though it was cold..ended up with the grossest feet after a week of walking and seeing sights! I would love to win the Milky foot for my partner who has the worst neglected feet ever! He has layers and layers of dry horrible dirty looking skin, no kidding. I would like to treat him to this and make his feet brand new!! I will enjoy peeling away the dead skin ha ha!! I work with people with disabilities so Im on my feet all day everyday. I would love to try Milky Foot products to get my feet ready for spending Australia Day at the beach this year. I am a barefoot bandit, oh yes I am, and my poor feet do tend to pay the price. My heels are so dry and cracked, they are like velcro on my bedsheets. Full foot treatment/pedicures don’t even really improve it much. My feet need deserve to feel confident this summer!